Chinese leader Hu Jintao pledged Monday to make the communist government more open and responsive while moderating the juggernaut economy to produce more balanced growth. Opening a pivotal Communist Party congress seen as a major test of his political strength, Hu outlined policies intended to make China more prosperous and stable by raising incomes and improving the party's hold on a fast-changing society. While offering few specifics, Hu said Chinese citizens would have "more extensive democratic rights" by 2020, China's target year for establishing lasting economic security, even as the party retains its monopoly on political power. "Contemporary China is going through a wide-ranging and deep-going transformation. This brings us unprecedented opportunities as well as unprecedented challenges," Hu told the more than 2,200 delegates gathered in Beijing's massive Great Hall of the People for the once-every-five-year meeting. The address was the most public event of the weeklong congress, whose chief purpose is to reappoint Hu for a second five-year term as party general secretary. A key measure of Hu's influence will be how many of his political allies he can maneuver into top party jobs, including protDegDes expected to take over from him when he steps down in five years. Broadcast live on nationwide television, the far-ranging speech lasting more than two hours and 20 minutes was one of Hu's most important public addresses since taking over as party leader at the last congress in 2002. 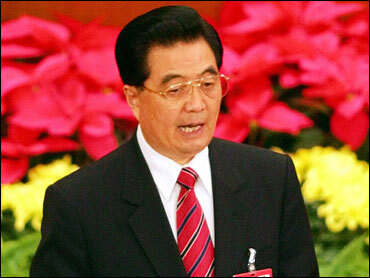 Reflecting Hu's cautious manner, it contained few initiatives while laying out a blueprint for upcoming policies. Hu also promised to continue a buildup of China's military, emphasized Beijing's preference for a peaceful settlement with rival Taiwan, and pledged to use the country's economic and diplomatic clout as a force for peace internationally. With Hu at the midway point of his expected 10-year term, the congress offers him a chance to further entrench his role as first among equals in the party's increasingly collegial leadership structure. "I think the secretary-general did very well with this speech," said Shen Ruixiang, a district party secretary from the thriving eastern province of Jiangsu. "I'm sure he'll emerge from this congress with even more authority and prove an even better leader," Shen said. In his report to the congress, Hu dwelled on his signature policy, a push to re-channel breakneck development by spreading the benefits of economic growth more evenly that goes by the rubric "the scientific outlook on development." Hu referred to the social divisions that have erupted from fast growth - gaps between rich and poor, urban and rural - and made an oblique reference to an emerging, demanding middle class. "There are still a considerable number of impoverished and low-income people in both urban and rural areas, and it has become more difficult to accommodate the interests of all sides." While Hu spoke, police and soldiers who sealed off Tiananmen Square and the areas around the Great Hall of the People detained at least two dozen people, many of them elderly, forcing them into police vans. Many carried documents detailing grievances against local officials and hoped to get the attention of Chinese leaders. In looking outward, Hu reiterated an offer to end the hostilities between China and Taiwan since their separation amid civil war 58 years ago. Hu, however, restated a condition for talks that has been anathema to Taiwan's democratic government - that the island must recognize that it is a part of China. Hu reveled in the achievements China has made since he took over, pointedly referring to income growth and its two manned space missions. "During this period, China's overall strength grew considerably and the people enjoyed more tangible benefits. China's international standing and influence rose notably," Hu said. Hu's leadership has never been threatened, but he is largely seen as weaker than past leaders, forcing him to compromise on some top appointments and other decisions. In a sign of possible constraints, Hu's retired predecessor, Jiang Zemin, was appointed to the committee handling the congress' arrangements, state media said Sunday. Deliberations over the next leadership lineup have been going on for months and will take place this week behind closed doors. Its makeup is officially announced after the congress ends. Hu is expected to push for the elevation of protege Li Keqiang onto the Politburo Standing Committee, while Xi Jinping, the party boss of Shanghai and the son of a revolutionary veteran, is also expected to get a seat.